Batik, an ancient textile wax and dying technique, is certainly one of the most renowned brandmarks of Indonesia. Intricate patterns and dying methods attributed to different regions and sultanates constitute an inestimable cultural heritage. UNESCO designated batik an Intangible Cultural Heritage in 2009. 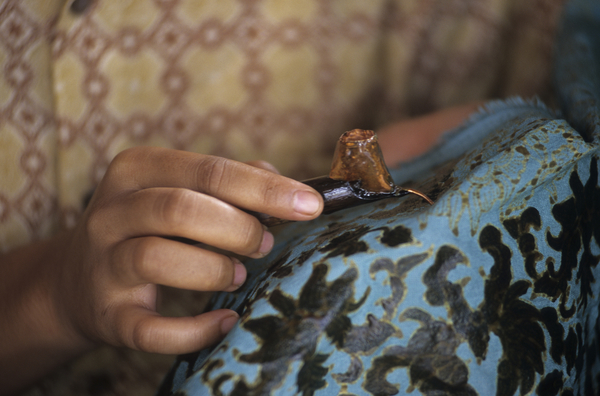 This technique of wax-resist dying is not only practiced in Indonesia. Historical cloths were found in different parts of the world including, India, Africa, Peru and Malaysia. However, the word batik has its origins in Javanese language. It means ‘titik’, dot or point. The Javanese batik motifs are probably the most sophisticated in the world. They are strongly linked to the island’s ancient kingdom’s traditional textile centers. The royal cities of Yogyakarta, Surakarta and Cirebon remain major centers for textile production. In the past, certain batik patterns were reserved exclusively for members of the royal families and court nobles. Through elaborate symbols and color codes, they reflected the ruling dynasty’s influence. Traditional colors were indigo, yellow, red and brown. In Java, specific motifs are worn on major life events like birth, wedding or death. Batik reached a peak of creativity from 1890 to 1910 but declined during the twentieth century as Indonesia became more highly westernized. Today, batik clothes are normally worn with traditional outfits on occasions like official or religious ceremonies. Or for traditional dances and theater. The technique of batik is similar all over Java but the patterns differ in each area. The long artisanal process begins with drawing the motif on a piece of white cotton. This is followed by the application of hot wax, using a pen-like tool called ‘canting’, to block parts of the fabric before the dye bath. The dyeing procedure usually starts with a light colour and gradually moves toward darker ones. Hot wax is added to selected parts of the motif between each colour. Finally, the wax is removed by dipping the cloth in boiling water. It can take several days, weeks and sometimes months to achieve a traditional two-meter cloth. Young girl making batik, Yogyakarta, photo © Dominic C.
The traditional ‘canting’ is a copper pipe with a thin spout that releases the hot wax. The handle is usually made of bamboo. In the last few years, batik motifs started gaining in popularity again. Unfortunately, the original wax-resist technique is very often replaced by factory printed fabric. Many Indonesian contemporary artists and fashion designers integrate traditional designs into modern creations. Their efforts to promote batik and pass it on to future generations is admirable, especially when they use the original wax-resist technique. With its refined designs and complex symbolic representations, batik remains a source of pride for Indonesians.